Recruitment for the 2019-2020 school year began in March. Please note, Parent Night is Monday, April 8th from 6pm-7pm in the Quimby Oak Middle School Gym. See Parent Night flyer for more information. The application deadline for the 2019-2020 school year is May 17, 2019 at 4:00 pm. You may begin to turn in applications on Wednesday, May 1st at 2:00 pm. If all seats are not filled by May 17th, registration will continue until full, and a waiting list will be maintained. How will the admission work? Quimby Oak students (intras) will have priority over students that are attending schools outside of our attendance area (inters). If you live within the Quimby Oak attendance area, applying to LSI is an automatic option. If you are out of district, or would like to apply for school choice, more details can be found on our school district's transfer policies: School Choice, Interdistrict Transfer Request, and Open Enrollment. Will we need to re-enroll every year? Once your student is enrolled in LSI, you will not need to re-enroll them again. It is understood, based on the application, that LSI is a two year commitment for 7th and 8th grade. How do I apply to attend LSI? LSI has an application form that needs to be submitted at the Quimby Oak Middle School office at 3190 Quimby Road San Jose, CA 95148. You may download the application directly from our website. The deadline for the 2019-2020 school year is Friday, May 17, 2019 at 4:00pm (PST). Applications include a student essay submission. This submission is not evaluative, but a necessary component of our application process. We want all students to share with us why they've chosen LSI. It is an important part of building initial relationships with our potential student body. Applying to LSI is a family decision and we believe that students should also have a say in what works best for how they learn. Applications without an essay submission will not be accepted. How many spaces are available to incoming 7th graders? There are 150 available spaces for incoming 7th graders. Applications will begin to be accepted on May 1st at 2:00 pm (PST). All applications need to be turned in to Ms. Pinter, the school registrar, for a date/time stamp and placement on the enrollment list. After 150 applications have been received the following applications will be placed on a waitlist in the order they were received. If my child does not get into LSI is my current placement secure? 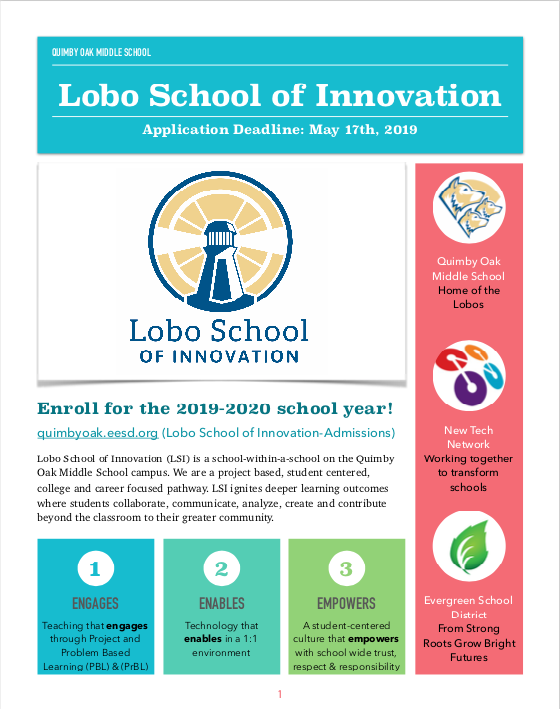 They will remain at Quimby Oak Middle School and receive a Lobo Comprehensive Program (traditional) schedule. Do you need any sort of special grades to get into the school? Grades are not a determining factor. LSI is an option for all students in Quimby Oak Middle School's attendance area that choose to apply.